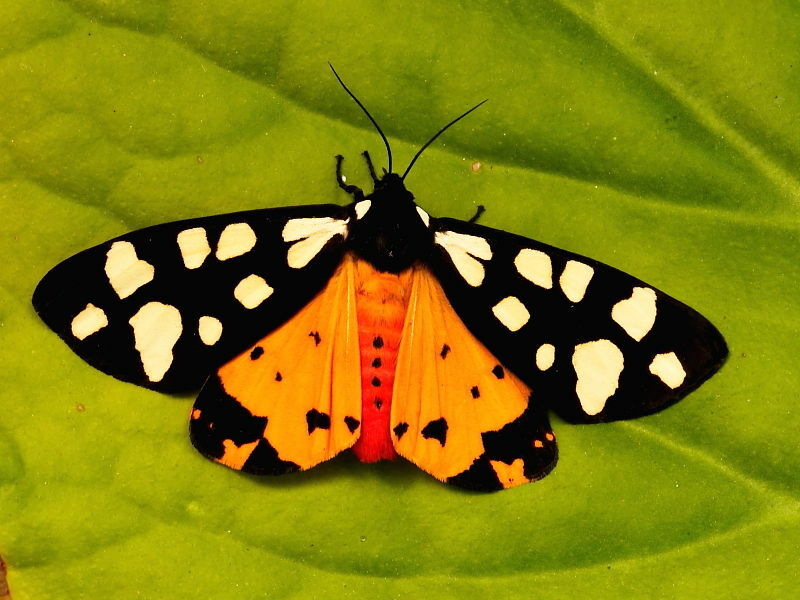 The Cream-spot Tiger Moth is a dramatically colourful species with a more restricted range in the British Isles than its close relative the Garden Tiger. 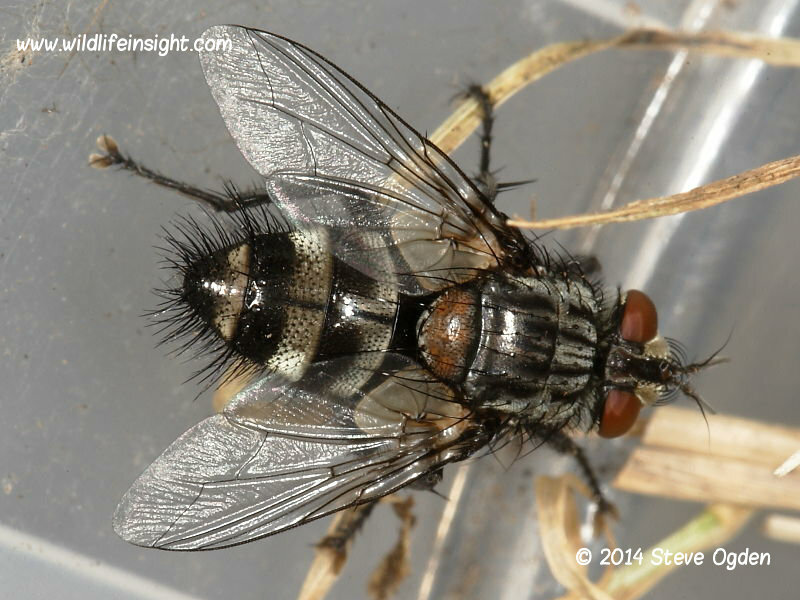 In the British Isles it is found south of a line roughly drawn from The River Severn to the Wash.
Its distribution is also localised and most frequently recorded near the coast. 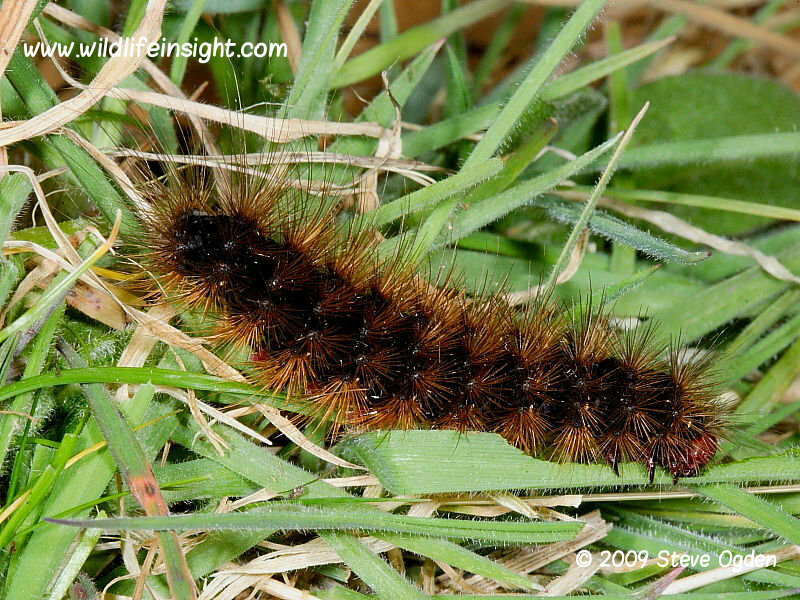 The caterpillars feed on various herbaceous plants such as dandelion, dock and plantain. 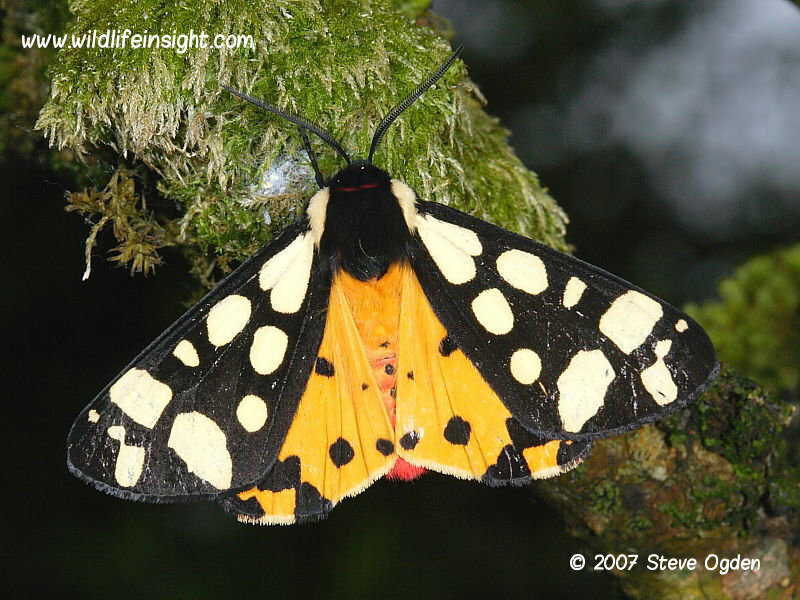 The Cream-spot Tiger has a wing span of about 50 mm and is one of the most easily recognisable moths in the British Isles. The creamy pale spots set against a dark forewing are distinctive when seen in a natural resting position with wings closed. When disturbed and sensing danger the moth opens its wings and displays an orange/red abdomen and yellow hind wings to warn off predators. The bright colours suggest that it is distasteful to birds. 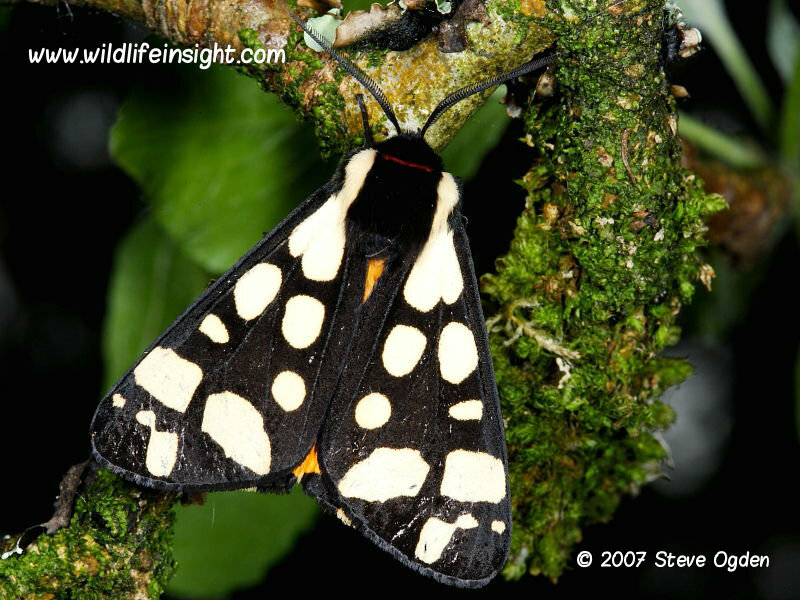 The Cream-spot Tiger moth is unlikely to be confused with any other species in the British Isles including other Tiger moths such as the Garden Tiger, Scarlet Tiger, Ruby Tiger and the less common Jersey Tiger. 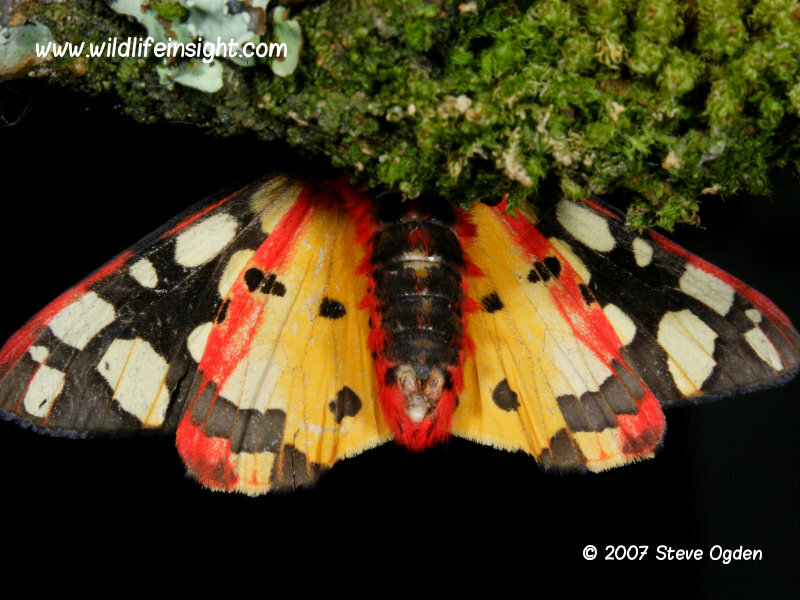 However, there are rarer forms of Garden Tiger, Scarlet Tiger and Jersey Tiger which also have yellow hindwings. And the scarce Wood Tiger also has yellow hindwings but is much smaller. The adult moths fly at night in a single generation between May and July when they are attracted to light. Although mainly a nocturnal flying species the newly emerged adults may be seen during the day resting amongst low growing plants. The female lays batches of 50 or more eggs on the leaves of a wide variety of herbaceous plants. 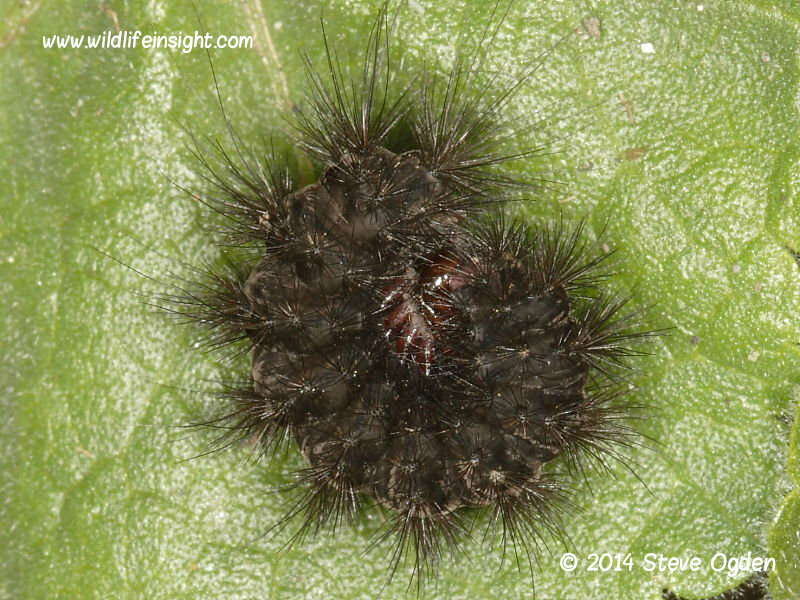 The Cream-spot Tiger caterpillar grows up to 65mm, has a black body with tufts of thick brown hair, a brown head and reddy brown prolegs. The caterpillars are frequently found resting on low plants basking in the sun. The eggs hatch within ten days and the caterpillars soon disperse and continue to feed throughout the summer and Autumn and sparingly over the winter. They are fully grown by the Spring and are frequently seen on paths wandering in search of a place to pupate. 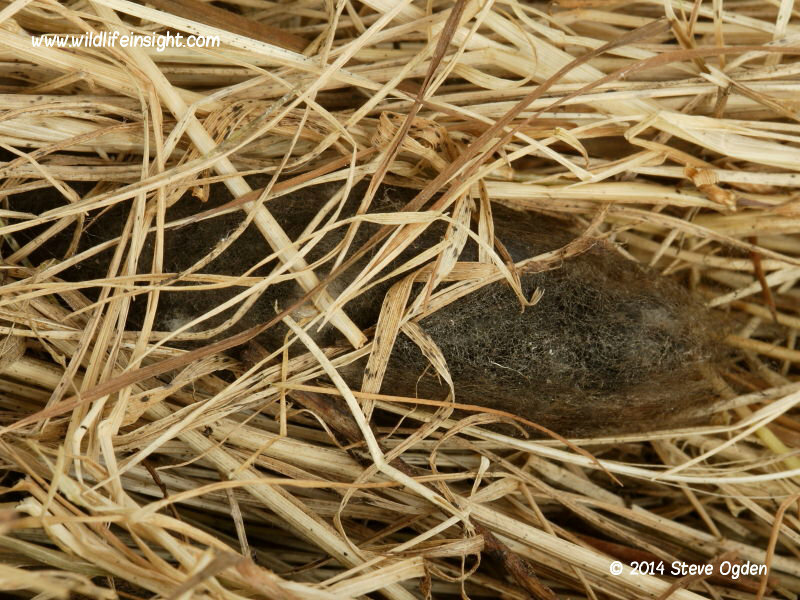 A cocoon is woven using its own hairs amongst low lying vegetation and leaf litter. The adult moth emerges after about 20 days. This species is easy to rear in captivity provided suitable over wintering conditions are provided. 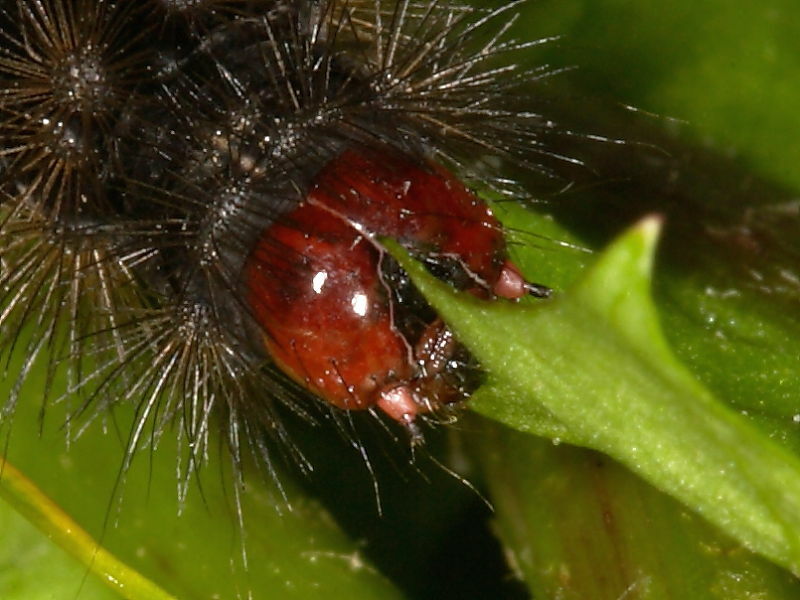 Late instar caterpillars collected from the wild are often parasitized.